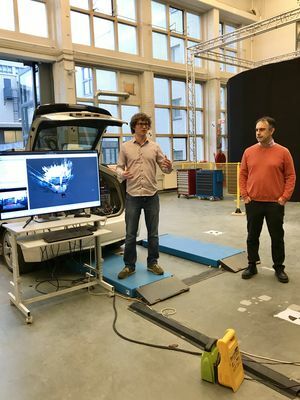 Dean Theun Baller and Hans Hellendoorn, head of the Department of Cognitive Robotics, oversaw the festive opening of the new CoR lab this month. One of the main focuses of the research at CoR is human-robot interaction. 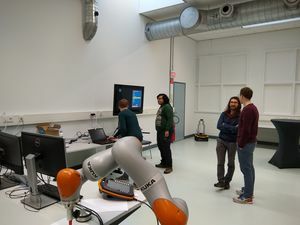 The participating researchers demonstrated how they work on robotics solutions in a ‘human environment’. 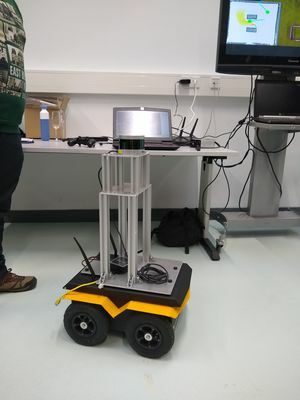 A robot that manages to find its way through a space filled with numerous obstacles; a robotic arm that responds to a human when he gives the robot a push; robots that work together; drones that fly through a small space without colliding; or an intelligent vehicle that knows exactly when someone is crossing a road. Bachelor and master students, as well as PhD students, work on these problems in the lab. The aim is to make it possible for the robotic systems of the future to effectively learn from various experiences, actively acquire knowledge and maintain/improve the process in order to achieve performances with a high degree of autonomous action. CoR’s mission is to provide excellent research and education in the area of machine perception, artificial intelligence, motion planning, dynamics, human-robot interaction and systems integration, with applications in robotics, smart industry and intelligent vehicles. The research being conducted by CoR has introduced new research methods in physical prototypes, in order to generate realistic robotic solutions that can function in a complex everyday environment. The focus of the research is on learning and autonomous control, robot dynamics and human-robot interaction. Read more about the Department of CoR.